Please take a minute to share our loss and read about a Real American Hero. 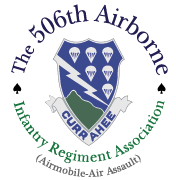 Currahees morn the loss of Bob Acklen a co-founder of the 506th Infantry Regiment Association. Bob died on the evening of December 31, 1998, after being diagnosed with cancerous brain tumors in September. Funeral services were held at 2:00 PM, Monday January 4, 1999 at the Park City Presbyterian Church, Dallas Texas. Graves side services were held at 10:00 AM, Thursday January 7, 1999 in the military tradition with an honor guard from the 101st Airborne Division Air Assault, at the Mount Olivet Funeral Home and Cemetery, 1101 Lebanon Road, Nashville, Tennessee. Remembrances and sympathy notes can be sent to The Acklen Family P.O. Box 600093, Dallas, Texas. Bob is survived by his father, Robert L. Acklen Sr., two sisters Caroline and Aimee, brother John, and long time friend Linda Johnson. Robert Livington Acklen Jr. was born March 24, 1941 in Nashville, TN. Commissioned a second lieutenant in the Infantry on May 27, 1967 at Texas A&M University, College Station, Texas. After completion of Helicopter Aviation School, his tour in the Republic of Vietnam began on October 6, 1968 with assignment to the 1st Aviation Brigade. After 14 months as a helicopter pilot he extended his tour in Vietnam and was reassigned, in December 1969, to the 101st Airborne Division (Airmobile). Upon arrival in the Division he requested an infantry assignment. He was assigned to the 3rd Battalion, 506th Infanry (Airmobile) during 1969 and 1970 and served as Company Commander of both B and C Company. In October 1970, he extended again, this time being assigned to fly Cobras with B Troop, 2 Squadron, 17th Cavalry out of Camp Eagle. Then in February 1971 he returned to the 1st Aviation Brigade where he remained until June 1971 when he was medi-vac'd back to the United States following a helicopter crash after almost 33 months continuous in-country. After 22 months in the hospital he returned to active duty and served with the 2nd Infantry Division in Korea. On April 30, 1976, at Fort Sam Houston, San Antonio, Texas, he was medically retired, with the rank of Captain, for physical disability as a result of the injuries he received in Vietnam. On October 28, 2000 Texas A&M University inducted Bob into its Corps Hall of Honor. On April 7, 2010 Texas A&M University and The Association of Former Students announced Bob as one of the recipients of the 2010 Distinguished Alumnus Award. Anyone may contact Bob's sister Carolyn Bender, his family would like to hear from his friends.